These Cinnamon Sugar Banana Bread Muffins are light, moist, perfectly sweetened, and loaded with banana bread flavor. They’re dipped in butter and then in an irresistibly good cinnamon sugar topping. This super easy recipe will become one of your breakfast favorites! 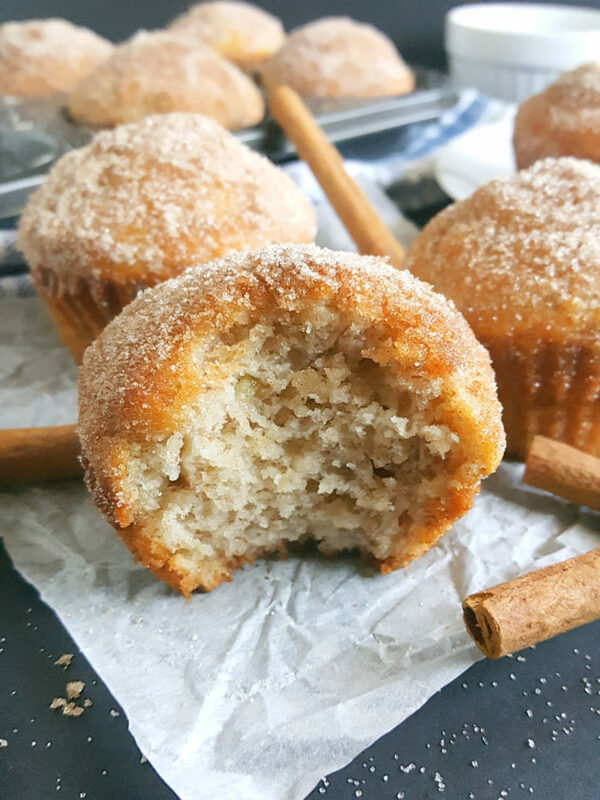 Yes, this is yet another Banana Muffin recipe but this one has been taken to the next level.We all know a little butter tastes good on Banana Muffins and Bread but what about butter and cinnamon and sugar too?! Oh, yeah. You’re in for a treat. 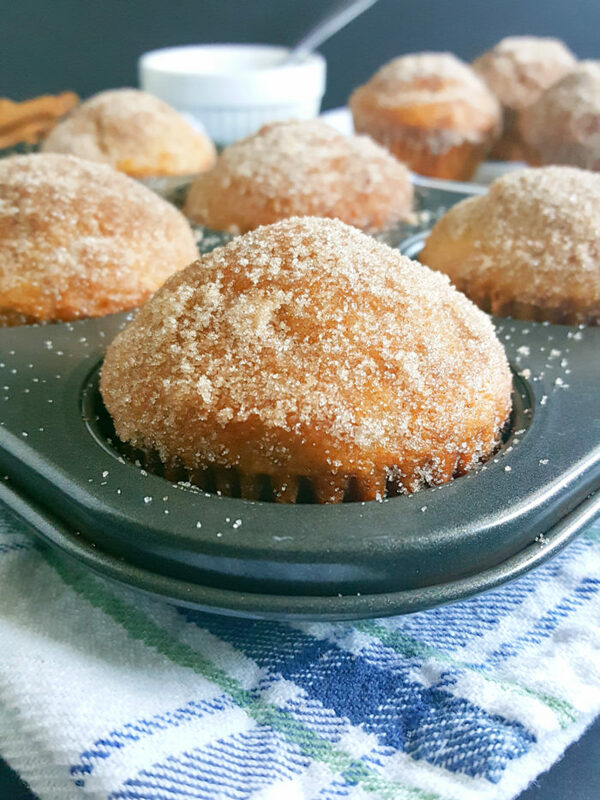 I’ve tried my fair share of banana muffin recipes (and I’m sure that you have too) but this is, hands down, one of my absolute favorites. After having these once, you’re going to make them again and again because they taste so good and they’re so easy to make. You don’t even need a mixer! You start by combining mashed bananas, sugar, cinnamon, and salt in a large bowl. Next, you’re going to beat in the liquids; egg, milk, oil, and vanilla extract, until the mixture is smooth. Add the dry ingredients and gently fold until combined. Pour the batter into the muffin pan and bake. While the muffins are baking combine cinnamon and sugar in a small bowl and place the melted butter in a separate bowl. When the muffins are done baking and have slightly cooled, dip the top of each one into the melted butter and then into the cinnamon sugar. See? This is a very simple recipe that’s easy to make just like all of the other baking recipes that you’ll find here at Beat Bake Eat. Oh and just a heads up; because the muffins will still be warm when you top them with cinnamon sugar they will be really soft and a little flimsy. So just take your time with each one and maybe use a kitchen utensil to help. To get the most banana flavor out of these muffins you need to use bananas that are overripe. Not just yellow ones, but ones with freckles and are a little brown. Those are the best to bake with because as bananas ripen they start to develop this naturally sweet richness that adds a greater depth of flavor to banana muffins. Bananas are a staple in my household. I always buy them when I go grocery shopping and I can never seem to get just the right amount of bananas. It’s either I don’t buy enough or I go overboard and buy too much. This time around I bought too much. I bought so much that I had to put a whole bunch in the fridge because they were getting too ripe way too fast and I had no idea what to do with them. The first thought that came to my mind was Banana Bread, of course, but I didn’t just want to make plain old Banana Bread. I took a look around the kitchen to see what I had and there was oats and chocolate chips so I made this really delicious Oatmeal Chocolate Chip Banana Bread and I used the rest of the bananas for this recipe right here. I have to admit that I’m kind of a muffin addict. I make them all the time. Can you blame me though? With easy recipes like this one I’m surprised I don’t bake every day! Moist, Delicious, and Perfectly Sweetened. I was a little skeptical about these muffins being baked at such a high temperature all the way through but they baked up perfectly and they retained moisture! The only thing that’s important is that you need to divide the batter evenly among the muffin cups because the tops do rise high and if one muffin is quite large the top might end up burning. By the way, these muffins are done when a toothpick inserted comes out clean or with a few moist crumbs. I’m so glad I decreased the amount of sugar in this recipe otherwise these muffins would have been way too sweet. The cinnamon sugar topping makes up for the amount that was decreased in the muffins. 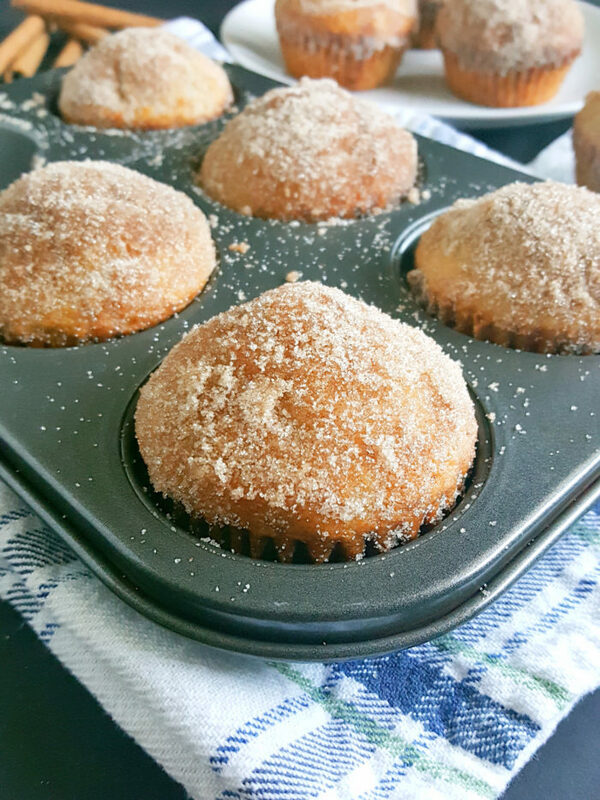 I love cinnamon so I did not hold back with these muffins but don’t worry they’re not overly spiced. They’re just perfect. And they are so delicious when they’re warm and fresh from the oven. And they’re especially good with a glass of milk. They taste great when they’re cooled all the way down too. They’re just good. Period. I can’t believe I used to buy Banana Muffins from the store and actually eat those things. They taste so artificial and innutritious. Take a good look at the ingredients. I bet you won’t be able to pronounce half of them and the sugar amount is always through the roof. Never wasting my money on those again and you shouldn’t either because these homemade banana muffins are the best! By the way, I did not have to tweak this recipe at all. I got it on the first try and for that I am so proud. I know it’s not a big deal to you but I bake a lot and when I say a lot I really do mean that. I love it when I nail it on the first try. It’s so damn satisfying. There’s nothing not to love about these muffins. 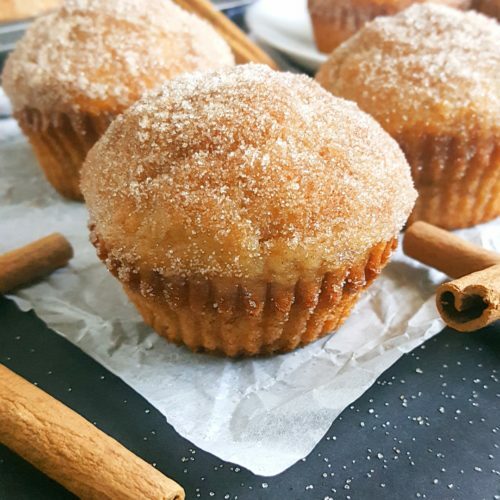 They smell amazing, they taste great, and the cinnamon sugar topping is so addicting you’ll want to take a bite out the top of each one. Trust me, after trying these you won’t want to go back to making just plain Banana Muffins. Hey, raw bananas taste okay but baking them is way better so grab those overripe bananas and give this recipe a try. I guarantee that it will become one of your favorites! Preheat oven to 400°F. Line muffin pan with muffin liners and set aside. In a large bowl combine mashed bananas, sugar, cinnamon, and salt. Beat in the egg, milk, oil, and vanilla extract. Add the flour and baking powder and gently mix until combined. Do not over mix. *Muffins are done when golden brown and a toothpick inserted comes out clean or with a few moist crumbs. 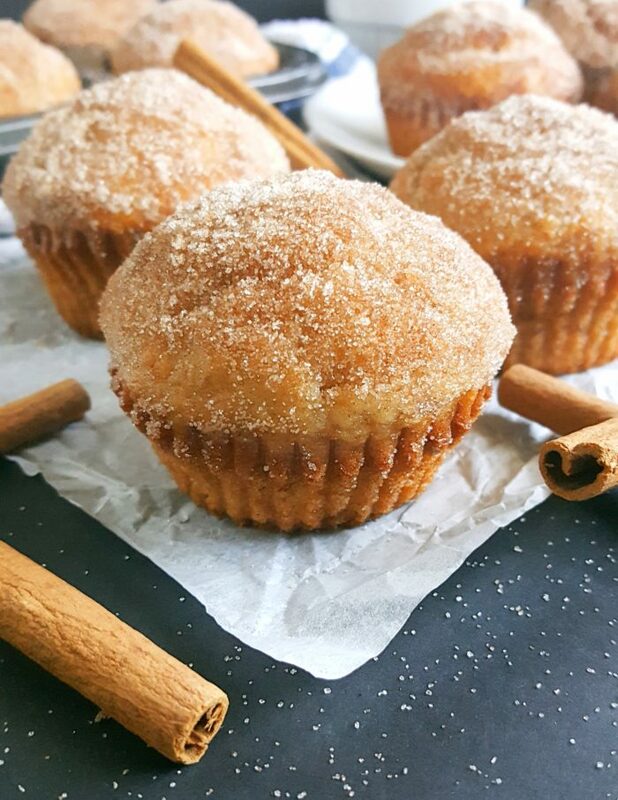 While the muffins are baking combine the sugar and cinnamon in a small bowl and place the melted butter in a separate small bowl. Once the muffins are finished baking, allow them to cool in the pan for 5 minutes. While still warm, dip the muffin tops into the butter and then into the cinnamon sugar.